The long walkway above Lake Ontario leads visitors to the unique architectural designed building of the Atlantis Event Centre in Ontario Place in Toronto. The opening of the Atlantis Event Centre was in 1971 and has since caught the interest of many with the water park, adventure theater, mini golf, IMAX theater, restaurants and other fascinating attractions. This complex was a project which took just over two years to complete at a cost of 29 million dollars and has become one of the most popular tourist attractions in Ontario. 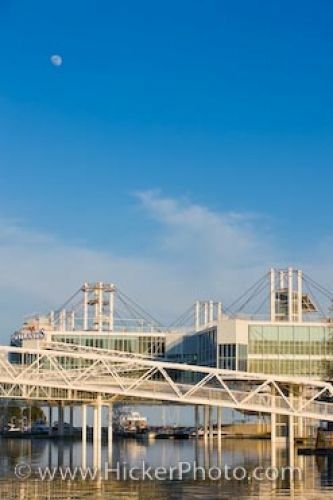 Picture of the complex home to the Atlantis Event Centre at Ontario Place in Toronto, Canada.